As ill-advised as it sounds, though, plenty of businesses are taking that approach to social media strategy. Our agency has seen clients ready to jump into tactics – channels, paid vs. organic, content creation – without developing the fundamentals of the strategy. They don’t know if they’re building a birdhouse or finishing a basement, but they’re powering up the table saw. If your brand was a person, would you want to hang out with them? 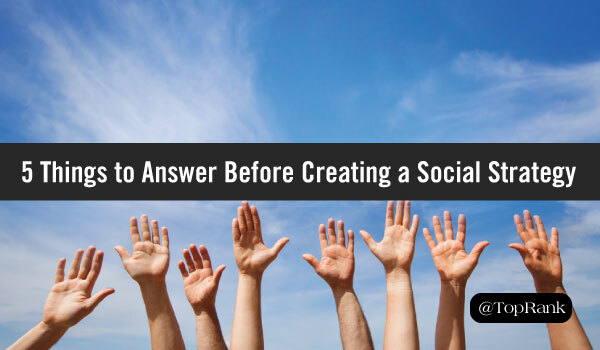 It’s a vital question, because you’re asking people to do just that – to willingly interact on a social level with your brand. So it’s vital to know how you will convey your brand’s values on social media (assuming you have your brand values firmly established). You’ll need to develop a personality that is consistent with your brand but fits with the level of discourse on each social media channel. Here are a few considerations to get you started. There are no universally correct answers to these questions, of course; it’s all about what fits your brand. Smart like a scholar or sharp like a poker player? Many of your answers may lie somewhere in the middle. In that case, determine where you fit on the continuum between each extreme. #2: Where Are You Now? In a large organization, you likely already have multiple social media accounts, with multiple departments and people running them. That sort of ad hoc administration won’t do for strategic social media marketing. Take time to map your brand’s existing social media presence, including brand accounts and high-level executive accounts. Include anyone who is actively speaking on behalf of the brand. Once you’ve done the audit, you can consolidate channels, see which channels marketing should take over, and provide direction to channels you won’t be directly controlling. #3: Why Is Your Audience on a Particular Channel? People generally come to Instagram to post pretty pictures and check out other people’s cool photography. On LinkedIn, they want to read business articles that will help advance their career. On Facebook, they want to discuss politics with people who already agree with them. Each social channel has a different purpose, and that will inform how your brand interacts on each. To see what kind of content your audience prizes, use a tool like Buzzsumo to track the top-performing and trending content relevant to your industry. See what people are liking, sharing, pinning, etc., and you’ll be better equipped to give audiences what they’re looking for. #4: What Do You Want to Accomplish on Each Channel? Now that you know who you are, what your raw materials are, and what your audience wants, it’s time to get to it. What are you building? Without that key element, there’s no strategy, just a series of random online interactions. Your goals should be different for each channel. Think about what each channel is good for, what your presence already looks like, and the actions audiences can take from each. On Twitter, your goal might be raising awareness, and promoting thought leadership. But on LinkedIn you might want to capture the audience by driving them to blog subscriptions and gated assets. Set a general goal for each channel, as well as measurable sub-goals. You should have clear metrics you can analyze and optimize. #5: What Are Your KPIs (In Order of Importance)? In a perfect world, every social media activity would increase subscribers, capture leads, and promote conversions all at once. We have plenty of prospective clients who ask for just that: An all-of-the-above approach. Unfortunately, doing everything at once frequently means doing none of it effectively. It’s important to establish your key performance indicators, but also to prioritize them. These priorities can (and should) change over time, but you should have a starting list before you plan a campaign. You might start with the primary goal of increasing your social audience, a secondary goal of driving subscribers to your site, and downloading an asset or other conversion as a tertiary goal. That’s enough differentiation to guide an informed strategy. Then, once you have built that audience, you might shift primary focus to the more middle and bottom-of-funnel efforts. Before you start developing your social media strategy, take time to understand what you want to build and what materials you have to work with. Get your fundamentals straight before you start strategizing, and definitely finish the strategy before you start implementing tactics. All that groundwork will help you treat social media as the powerful marketing tool it is. You will be far better equipped to succeed. Even better, you’ll know what success looks like, and you’ll be able to prove it to management. Ready to strategize? Check out the fundamental elements of a successful social media marketing strategy.